I remember walking out of the hospital. My husband lifted our son into the car. I remember the short drive home. We opened the car door, gingerly lifting his car seat out. I remember we shut the door and then walked towards our house. The storm door opened and then the wooden door after that. We walked inside and slowly placed the carseat with our son still in it on the floor beside the couch. I remember the sun shining brightly in through our bay windows. It was spring. The perfect time for new babies. I remember his newborn smell. That subtle, yet intoxicating and delicious smell that new babies carry with them. I remember our cat coming to investigate. She could smell it too. I remember the smell of the hospital was gone. That smell of sick and medicine. I had been nesting for weeks and our house felt so clean and fresh. I remember holding him. The weight of him felt so wonderful. He fit perfectly in my arms. I remember thinking that this small little baby was about to add so much life to our home. I remember the feeling of his terrycloth sleeper. It was yellow and had little animals on it. He was quiet and sleeping. I remember taking him upstairs and bringing him to his room for the very first time. I remember placing him on his diaper pad. 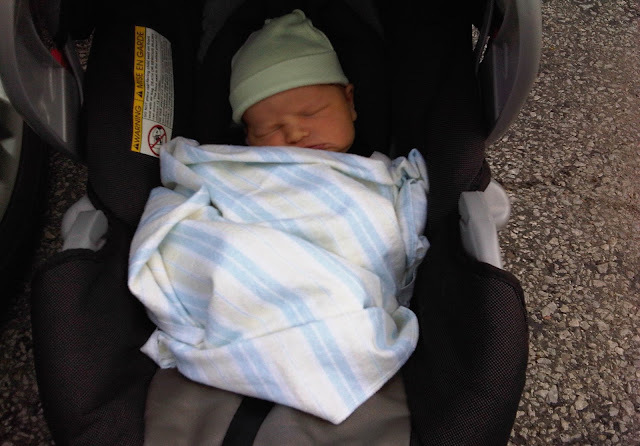 The sound of the buckle that snapped him in place because we were still very cautious as new parents. It was probably the only time we ever used that buckle. We stared at him. Silently hoping and praying that he'd be happy here with us. I remember his skin was so smooth. His newborn hair was so soft. Everything smelled light and clean. Everything was still. It was a happy stillness. A beautiful calm. I remember he nursed easily, and I thought so far we were doing okay. I remember it felt like we were moving in slow motion. Everyone else in the world, everyone else outside our home, was going about their lives. We were taking everything slowly. Every step was careful. Each one calculated. We had no idea what we were doing, and we wanted to get it right. I remember sitting gently on our couch, still store from the delivery. I remember hearing the click of the kettle as my mom boiled water for us and made us tea. Just a little bit sweet with some milk. Tea always settles my nerves. Even if they are happy nerves. And I remember knowing things would never be the same.